Are you looking to add a little flair to your decorating? 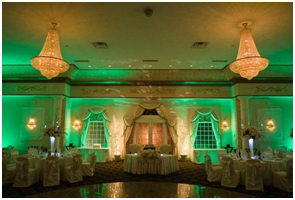 Up Lighting is a great way to incorporate your wedding colors into your ambiance. 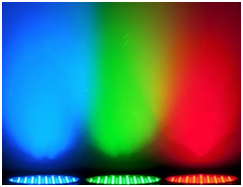 We strategically place Par Can Lighting around the venue to create a fantastic effect. You will have over 20 colors to choose from. 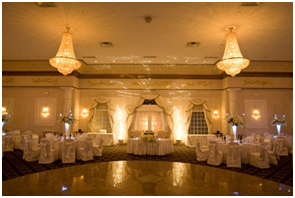 Gobo, Monogram Lighting can create the ultimate in customization at your reception. You can use your names, initials, customized logo, your wedding date or any combo of these. 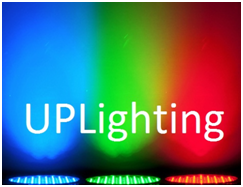 We’ll project this light on the dance floor or behind your head table. Your DJ will never have another event on your special day. Therefore, if you’d like to extend the time on the fly, we can be accommodating. Includes a separate PA system (when necessary) for playback of musical choices. A wireless lapel microphone for the pastor and an additional wired microphones is available for readers and/or musicians. Perfect for separate cocktail areas, outdoor spaces, multiple dinning areas, or multiple floor venues.